You can add features to your LUIS app to improve its accuracy. Features help LUIS by providing hints that certain words and phrases are part of an app domain vocabulary. A phrase list includes a group of values (words or phrases) that belong to the same class and must be treated similarly (for example, names of cities or products). What LUIS learns about one of them is automatically applied to the others as well. This list is not a closed list entity (exact text matches) of matched words. A phrase list adds to the vocabulary of the app domain as a second signal to LUIS about those words. LUIS allows up to 10 phrase lists per app. Open your app by clicking its name on My Apps page, and then click Build, then click Phrase lists in your app's left panel. On the Phrase lists page, click Create new phrase list. In the Add Phrase List dialog box, type "Cities" as the name of the phrase list. 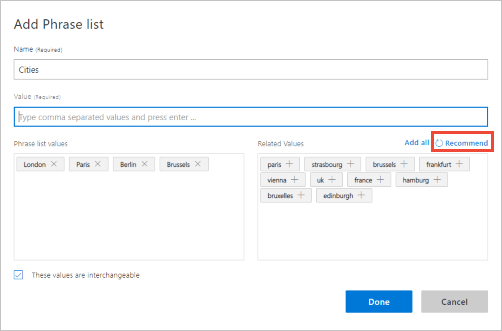 In the Value box, type the values of the phrase list. You can type one value at a time, or a set of values separated by commas, and then press Enter. LUIS can propose related values to add to your phrase list. 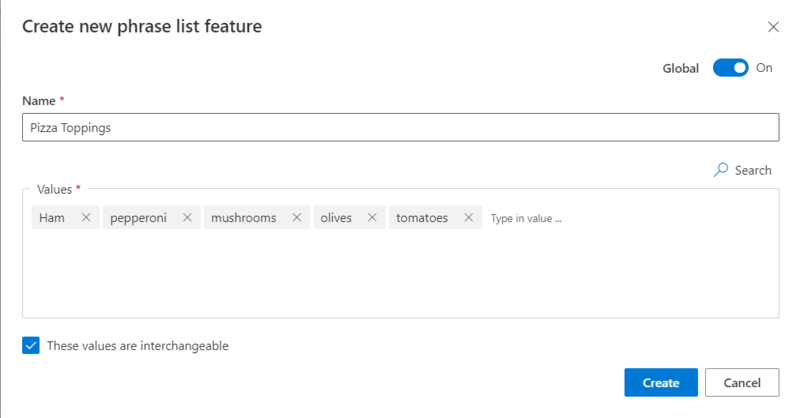 Click Recommend to get a group of proposed values that are semantically related to the added value(s). You can click any of the proposed values, or click Add All to add them all. 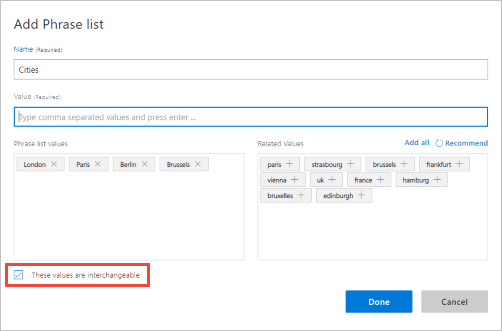 Click These values are interchangeable if the added phrase list values are alternatives that can be used interchangeably. Click Save. The "Cities" phrase list is added to the Phrase lists page. You can delete, or deactivate a phrase list from the contextual toolbar on the Phrase lists page. After adding, editing, deleting, or deactivating a phrase list, train and test the app again to see if performance improves.